Fresh lemon, herbs, and garlic come together in this fast and flavorful marinade. Complemented with fresh and bright summer veggies in this amazing meal that is under 400 calories! In a small bowl combine garlic, lemon zest, lemon juice, herbs, salt, pepper, and olive oil. Set aside. Place cut vegetables in a zip lock bag and add 3 tablespoons of the herb marinade. Toss to coat. Place chicken in separate bag and add remaining marinade and toss to coat. Let sit in the fridge for at least 30 minutes and up to 4-6 hours. Preheat the grill to medium heat. 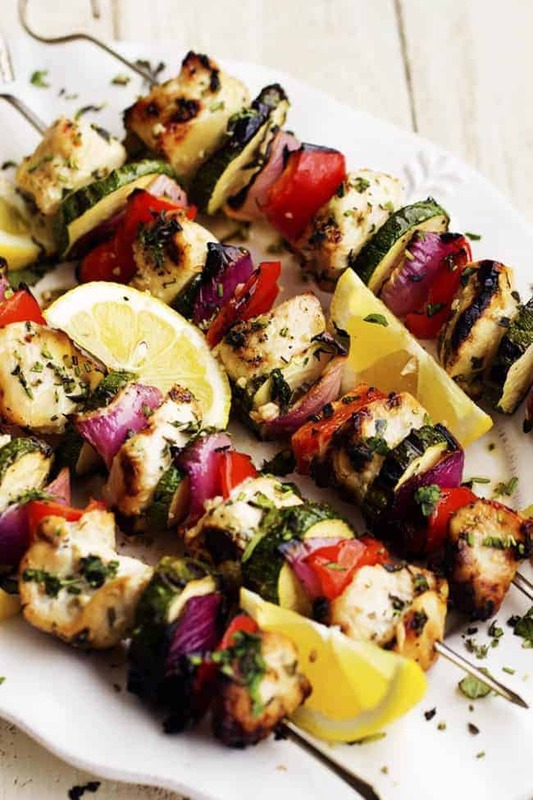 Thread the skewers alternating with meat and vegetables. Lightly sprinkle with salt and pepper. Grill for 3-4 minutes and then flip. Continue to cook and flip when necessary until the chicken is cooked through to 165 degrees. Serve with lemon wedges and squeeze on top.